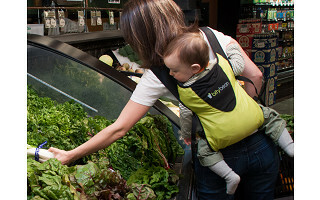 The Bitybean is a child carrier for little ones and even not so little ones. When Doug Hartwell became a dad he found himself wishing for a lightweight carrier that could handle not only a baby but a toddler as well. Doug put his engineering skills to use and made his wish come true with the invention of the Bitybean. Thoughtfully designed and cleverly engineered to carry babies as young as 3 months old and children up to 40 pounds, the Bitybean weighs just 8 ounces and folds up into an 8 x 3 inch roll. But don’t let its size fool you. Doug enlisted the help of a backpack maker to load this compact carrier full of fit and function. In addition to being ultra-lightweight, breathable and fast-drying, the Bitybean is strong and durable. It can be worn multiple ways as a front pack or backpack and is easy to adjust for children of different ages and stages as well as caregivers of all shapes and sizes. If only the Bitybean had been around when my youngest daughter was little. Long after she learned to walk, her favorite word was “uppy.” As much as I wanted to pick her up, constantly carrying her put strain on my body. Infant carriers were just as the name suggests—made for infants. Backpacks that could support her weight were bulky. The Bitybean is the solution I never had. Greetings from Bitybean in Vermont. We’re very excited to introduce our cleverly compact child carrier on The Grommet! We love engaging with customers so let us know if you have any questions about the most advanced baby carrier on the market today! We'll be online all afternoon to answer any special questions you may have or if you just want to say hello. Hi - this looks great! On your description it says Made in the USA, but in your product description it says Made in Mexico and Vietnam. Just curious as to which is true? @Joshua Thanks for asking- Bitybean is currently produced in Mexico. I suspect that this is an easy enough carrier to put on alone if wearing it as a front pack. How does one put it on, alone, when wearing it on the back? Could one be worn on the front and another on the back in the case of carrying twins? @Rebecca Great questions! Parents of twins love Bitybean because the shoulder straps are so thin that one will easily stack on top of the other. We do always recommend getting help when using back carry but with practice, it can be done solo. Just get baby into a piggyback position and pull the straps up around them. Can the baby or child be placed in a forward facing front position? I assume not, with no pictures but wanted to check. @Carrie Thanks for your question! Bitybean is designed to be used with baby facing inwards towards the caregiver, and provides knee to knee support. I am interested in your product, but as a grandmother who has never used such a device, I sure wish you would have actually shown someone putting their child into it and then putting it on. Seems the video should have shown actually use. Not just still shots. I can not figure out how on earth it works. Diagrams don't do it for me. Why do a video and not actually show us how it "really" works? too complicated? Does it require 2 people to use it? Please consider changing the video to reflect actual use, on and off. As with most carriers we do recommend using a helper for first-time use, and for the back carry position. 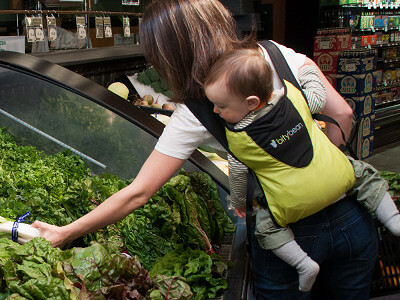 The Bitybean is a child carrier for little ones and even not so little ones. When Doug Hartwell became a dad he found himself wishing for a lightweight carrier that could handle not only a baby but a toddler as well. 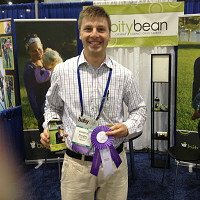 Doug put his engineering skills to use and made his wish come true with the invention of the Bitybean. Thoughtfully designed and cleverly engineered to carry babies as young as 3 months old and children up to 40 pounds, the Bitybean weighs just 8 ounces and folds up into an 8 x 3 inch roll. But don’t let its size fool you. Doug enlisted the help of a backpack maker to load this compact carrier full of fit and function. In addition to being ultra-lightweight, breathable and fast-drying, the Bitybean is strong and durable. It can be worn multiple ways as a front pack or backpack and is easy to adjust for children of different ages and stages as well as caregivers of all shapes and sizes.